The bigger hard drives get, the more room they provide for unwanted files to clutter up your disk and steal space you could otherwise put to better use. Rocky Sand Studio’s Disk Diag (Mac App Store link) hunts down and eliminates these megabyte-hogging miscreants, while keeping you fully informed and in control of the process. On startup, a simple but beautifully-animated speedometer-style dial snappily shows you the ratio of empty to occupied space on your drive. 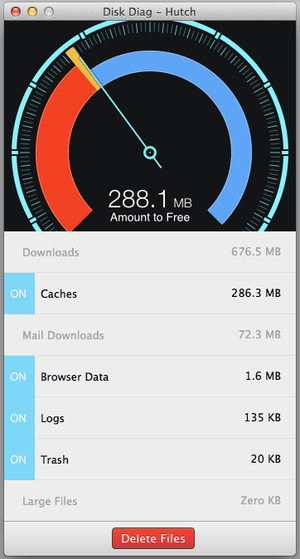 Click the Start button, and in a few more seconds you’ll see how much space Disk Diag thinks it can free up for you. The program breaks this chunk of disk space into multiple categories, including your caches, your log files, and your Downloads folder. You can turn each on or off individually, and by clicking icons that appear when you mouse over each category, you can open a Finder window with the files in question, or get a plain-English explanation of what the files do and why you might want to delete them. When you’re ready to go, click Delete Files, and watch as Disk Diag chews through its targets. Its dial readout indicates when it’s disposed of each batch of files, but there’s no progress bar per se—which got a little weird for me when the program took unusually long to eliminate its final 15MB of files, without any indication why. I also found Disk Diag’s initial prompt to harvest my email a touch obnoxious. But it’s strictly optional, and didn’t reappear after the first time I opened the program. I got Disk Diag on sale, but even at its standard $6, it provides excellent value. If you’ve got a capacious drive overrun with unwanted hangers-on, Disk Diag offers a fast, friendly way to evict them.